Every fluorescent tube or CFL contains mercury—typically 15mg in 4 foot tubes and 5 – 10 mg in Compact Fluorescent Lamps (CFLs). This mercury must NOT go into landfill—it needs to be processed by specialist recyclers. Crush and contain fluorescent tubes of any length. Also handles CFL bulbs. Reduce the volume of fluorescent tubes by 80% into 200 L drums. Takes one second to crush a fluorescent tube and to safely contain the mercury vapour. 5 Stage Filter system—including a HEPA and Active Carbon filter. On board controls and machine diagnostics including Filter change warning. LCD display that tells you the machine mode and any fault states. Meets U.S EPA Regulations. The machines have been tested for mercury vapour leakage and they pass all the tests set by the US EPA. Eliminate storage hassles – Reduce your needed storage space for lamps by crushing up to 1350 T8 4’ lamps per 55-gallon drum. The Bulb Eater® lamp crusher crushes all length lamps. Reduce handling – Handle your spent tubes & bulbs once. Simply operate the Bulb Eater® tube crushing machine on a 200 litre drum near the lighting up-grade area or into a storage area. Save roughly 20 hours of labour per 1000 lamps by crushing rather than boxing the lamps! S afer work environment – U.S EPA studies show an estimated 2-3% accidental breakage rate while boxing lamps prior to pickup. The 0.001% emission rate from the Bulb Eater® tube crushing system provides for much less mercury vapour emission. Cut costs – By pre-crushing the lamps, facilities such as Ecocycle or Toxfree are able to save money on their tube handlling costs by having to run the tubes & CFLs through their machine. Go HERE to find a FluoroCycle approved collection company near you anywhere in Australia. Saves space– crush over 5,000 4 foot fluoro tubes into just 4 drums. Safely. CLICK HERE TO WATCH THE Aircycle VIDEO. 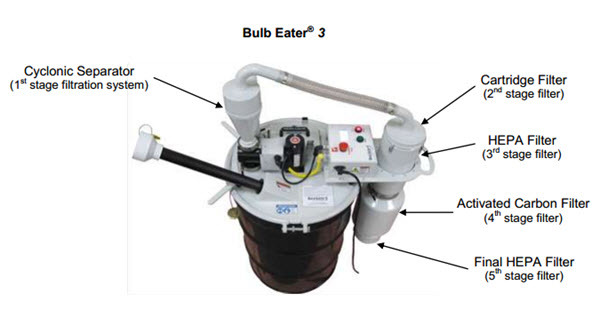 The Bulb Eater® VRS-U lamp crusher is equipped with a side-mounted dust filter unit containing the highest quality HEPA filter available. This works in conjunction with an activated carbon filter located in a steel canister. The activated carbon filter actively captures and neutralized the mercury vapour released from the tubes & lamps during crushing. Energy Cost Attack is the distributor for the Aircycle machine in Australia. We can deliver to capital city airports. Pricing – around AUD$7,500 including freight, spare filters and duty. Subject to currency movements. For a firm quote and delivery details please contact Tim Etheridge on 0416 211 882 to discuss your requirements or ask questions.